An education program where students of all ages can erect a quarter-scale, timber-frame model barn. The NBA is connected to three different models that include a Dutch barn, a Mid-Western barn, and a New Englad barn. These 3-D hands-on, life-size puzzles routinely travel to classrooms to demonstrate historic construction techniques while challenging students to use their math, science, and engineering skills. The National Barn Alliance’s focus on education is in full swing with our traveling Teamwork & Timbers program. It is an education program where students of all ages can erect a model barn while using math, science, and most importantly—learning to work as a team. The NBA owes a great debt of gratitude to Russ and Lou Ann Mawby from Michigan for their generous support of this program. The NBA owns and manages a model based on the Dutch barn, an early barn type that is predominantly found in the Hudson River Valley, but also perpetuated by Dutch immigrants and their American descendants elsewhere in the country. Two additional barn models are connected to the NBA, one is based on a Mid-Western barn in Illinois built around 1842. The other is the result of the NBA partnership with timber-framer, Tom Musco, to create a New England model based on his study of that barn type. These barn models routinely travel to elementary and middle school classrooms to demonstrate historic construction techniques employed in many American barns. NBA volunteers and member organizations aid students in an exercise of teamwork as the children “raise” the barn models. 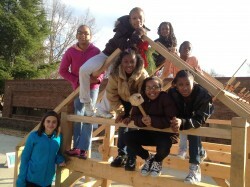 Working in groups, the youth are exposed to math and science while building this 130-piece, 1100-pound timber frame. Along the way they learned about types of wood, history of rural structures, parts of a barn, and most importantly why team work is so important…. one person can’t raise a barn. Unknowingly, they employed their math, science, engineering skills to raise the frame with great success. Essentially life-size, 3-D puzzle, it teaches students (both young & old) how barns were made, touching upon both sciences and humanities! Educators have found value in the program due to the duality of it touching upon history and science, but most importantly, they appreciated the teamwork and leadership skills developed during the exercise. For the youth, it is just plain fun while employing what they are learning in the classroom to use. Visit For Classrooms for more information on school programs. To date, the Teamwork & Timbers program has been in the Midwest and the East Coast of the United States. While the program has been focused on youth, adults can gain value out of it as well. An event schedule of the program and the model barn’s locations, please see our Events Calendar. See the Barn in Action!